Summer back in Minnesota was a soul-satisfying retreat of time with family and friends. I never fit in as much knitting as I think I will, but I still accomplished quite a bit. The BIG project this summer was a ten-stitch baby blanket for Kent’s cousin’s baby due in August. 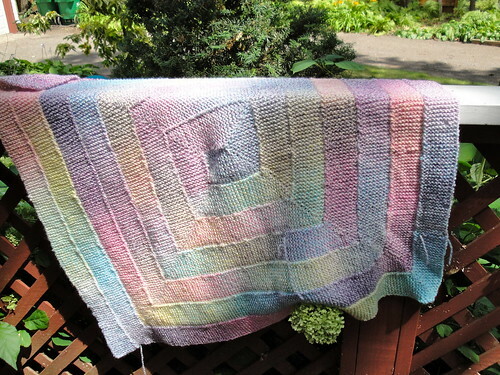 It is the same pattern I used for the first blanket that I completed. 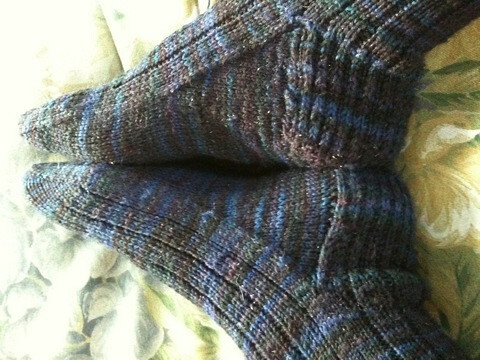 However, this time I used worsted weight instead of sock weight. It turned out much better. I was able to finish it in time to send it off the day before I headed back to Singapore. His cousin was delighted and sent me a note that is on his crib waiting for him to arrive. Another summer project was to finish my Starry Ribbed Socks. They are a simple top-down pair of K3,P1 socks. I ran into a a weird gauge problem around the ankles but a few washes has tightened them up. The colors are untrue in this photo. The sock actually very dark colors with metallic flecks. I bought it through DNBY because I love Dream in Color’s Smooshy yarn so much. 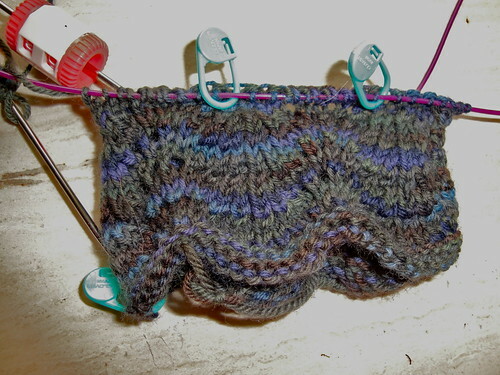 This yarn wasn’t quite as nice– not as smooshy but still a nice sock yarn. I continued work on my un-ending Ribbed Lace socks. I knit a lot with little to show for it. I had to knit the heel turn three times and it still isn’t right so I’ll try again. I prefer socks with heel flap and gusset, but turning a heel on a toe up sock isn’t nearly as fun as turning one on a top down sock. I’ll pick it up again sometime and conquer that heel, but for now I’m enjoying new projects. First on the needles was a sweater I began last summer. It is the Origami Pullover. I haven’t loved any photos I’ve seen of this sweater, but Lila and Claudine’s had a sample of it in their store that made me swoon. Fit me to a T and was flattering. It is a truly mindless project since it is knit as two long rectangles in K1, P1. I have the smaller one done that will become the front of the sweater. I’ve done about five or six inches of the wider back panel. It is a good travel project when I have room to carry it. It is a pattern from Frog Tree and I am using the recommend yarn, Frog Tree Sport Melange Alpaca. I cast on a new pair of socks as a travel project for when I don’t have the room to bring the sweater. 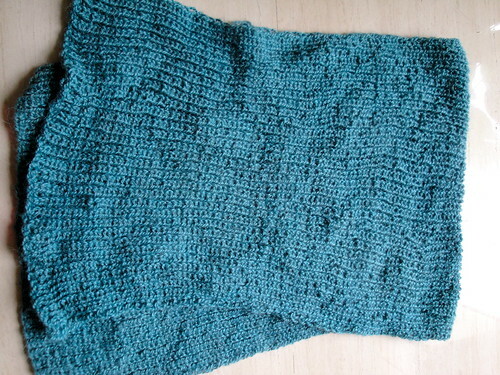 I am knitting Violet Green’s Waving, Not Drowning pattern, a title that makes me laugh out loud. I am using a skein of Cascade Yarns Heritage Paints that I scored from the Bella Lana yarn shop in Minneapolis, Minnesota. Louisecat25 brought me there because the store is too good to not visit. The pattern is easy. It is a four row repeat and rows 1,3 and 4 are stockinette . Row 2 is a feather and fan pattern. This makes for a great travel sock. I’m knitting them using magic loop on size 00 needles. I started a holiday gift today as well. Not sure if it will be done for this coming Christmas but it might. I am flying to Shanghai for a conference this month, and the flights might be a great time to work on it. It is the Good Luck Cowl by Christianne Gerstner. I cast on in the taxi on the way to our September knit out. I was able to finish the first repeat of the pattern. It is an easy pattern so hopefully all will go well. It has so far. 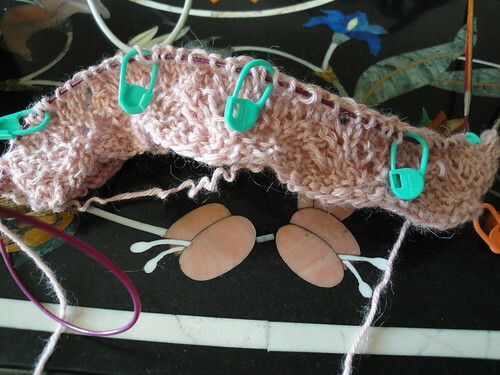 I am knitting it magic loop as well on size 3 needles. I was worried it was too loose but the more experienced knitters said it was fine. I didn’t intend to only update this blog quarterly, but considering that I don’t spend much time knitting during the school year, I may not write again for a while. Thanks for reading. This entry was posted in FOs, LYS, socks, WIP. Bookmark the permalink.